Italian painter in Pistoia (real name: Leonardo di Francesco di Lazzero Malatesta), not to be confused with another artist from Pistoia, also known as Leonardo da Pistoia though his real name was Leonardo Grazia (or Grazzi). Leonardo da Pistoia s style characteristically demonstrates the influence of Fra Bartolomeo and even more so of Raphael, to whom he had recourse numerous times for his designs. His signed and dated Madonna and Child of 1516 in the Staatliche Museen, Berlin, is a free copy after Raphael s Madonna del Baldacchino and another painting in Brussels derives from Raphael s Bridgewater Madonna. It appears that Leonardo da Pistoia was particularly inspired by Raphael s works of the first and second decade of the 16th century. 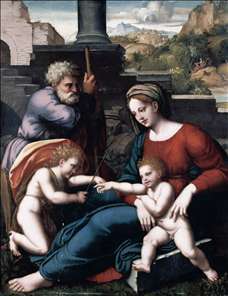 See more details about "The Holy Family with the Infant St John"